Completely Renovated and Refurbished in 2011!!! Come stay in your own luxurious Oceanfront Penthouse Condo. From the moment you step into this vacation paradise you will experience the tranquility that comes from living directly on the ocean! The Atlantic Ocean is the main attraction of the family room. The view, the comfortable couches and chairs, the gentle sound of the ocean waves rolling in—a perfect place for you to relax. At night enjoy your favorite programs on the large flat screen TV. In the morning, step out of the sliding glass doors to the large back terrace to sip your morning coffee. You will enjoy the breathtaking views for miles from the third story balcony, master bedroom, family room and kitchen! The master suite is complete with a king sized bed, TV, and bathroom with huge walk in shower, beautiful vanity and separate toilet area . Watch the sunrise (see the picture below) from your bed every morning! The second bedroom has a queen size bed, while the third bedroom comes complete with a single twin bed. These bedrooms share a brand new, completely renovated bathroom with separate tub/shower and toilet area. Spend your mornings on the beach, your afternoon by the pool and your nights eating in fabulous restaurants in St. Augustine. Wake up to a great sunrise from your balcony. From your third floor unit you can see the pier to Crescent beach. Thanks for making our honeymoon absolutely perfect. We enjoyed our stay here so much. We will most definitely be back! 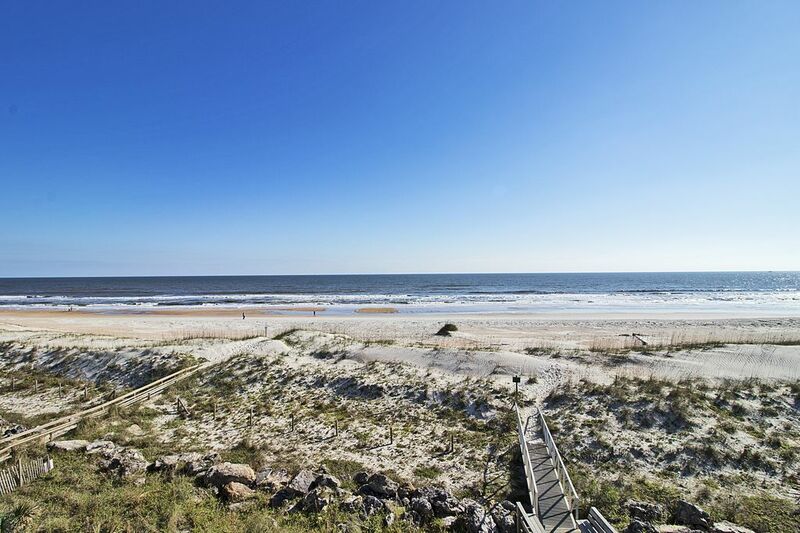 Very nice oceanfront condo on St. Augustine Beach. We very much enjoyed our stay at this condo. It was clean, had comfortable furniture and everything you would need for a stay at the beach. Very wide, uncrowded beach just outside your door. Close to restaurants, grocery store and downtown St. Augustine. Easy check-in with Endless Summer Realty and Zach was very responsive and checked in a couple of times to be sure all was good. I highly recommend this property. This is a great place to stay on the beach. Walked right out our door and onto the beach. The condo is spacious and has everything you need for a wonderful stay. It’s within walking distance of several good restaurants. We love St.Augustine for the history and the great food. The people are so friendly and helpful. Excellent location on the island with an amazing view and nice decor. Plenty of room for all of us. Loved the small, low rise building and less crowded beach. Hard to beat the beautiful sunrise view every morning. We will be back!